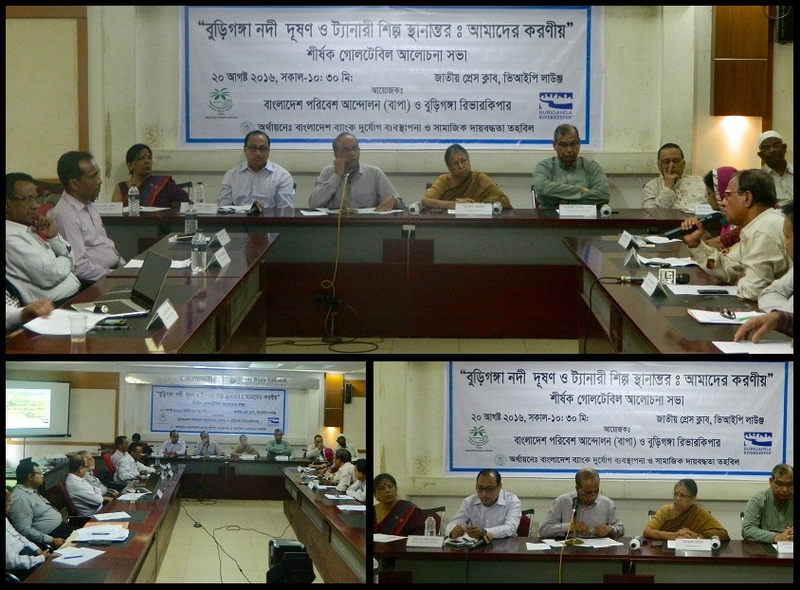 A roundtable meeting on “Pollution to the Buriganga River and Tannery Relocation: Our Responsibility” was held on 20 August 2016, organised jointly by Buriganga Riverkeeper and Bangladesh Poribesh Andolon (BAPA) at VIP lounge of National Press Club. The meeting was presided over by Sultana Kamal, vice-president of BAPA where Sharif Jamil, Buriganga Riverkeeper and Joint Secretary, BAPA delivered the introductory speech. Taqsem A. Khan, Managing Director of Dhaka WASA; Sharmin Murshid, Honorary Member of National River Conservation Commission; Md. Alauddin, Fulltime Member of National River Conservation Commission; Md. Solaiman Haidar, Director (Planning) of Department of Environment; Md. Gulzar Ali, Joint Director of BIWTA; Md. Abdul Kaiyum, Project Director of BSCIC Tannery Industrial Area; Md. Shahin Ahmed, President of Bangladesh Tanner’s Association; Md. Sakhawat Ullah, General Secretary of Bangladesh Tanner’s Association; Md. Abdul Malek, General Secretary of Hazaribag Tannery Workers Union; Umme Salma, the inhabitant of Kamrangirchar; Syed Abul Maksud, eminent writer; Mubasshar Hussain, former President of IAB; Mohd. Abdul Matin, General Secretary of BAPA and Syeda Rizwana Hasan, Chief Executive of BELA delivered their speech as the designated discussant in the roundtable meeting. Mr Abdul Malek said, ‘the worker’s affair i.e. their residence, education, medical treatment etc. were not considered in the relocated area of Savar.’ He requested to the authorities to think about these things seriously to make this relocation process feasible. Mubasshar Hussain requested to the Government to take necessary steps against the illegal occupants and river polluters. He suggested, if necessary, the government should declare special tribunal to bring them under legal action. Umme Salma said, ‘Children of the entire downstream area after Hazaribag are also in great health risk. We cannot walk beside Buriganga with our children.’ She requested to the Government to protect Buriganga River as their want to live and livelihoods are directly related to the river Buriganga.